As you've likely heard at this point, writer, actor, director, etc. 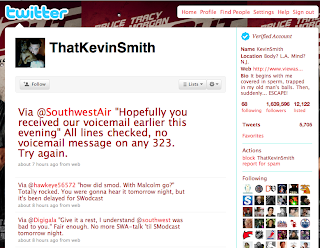 Kevin Smith is using his Twitter stream -- and, later today, his podacst -- to wage war on Southwest Airlines because he says he was deemed a "safety threat" by an airline captain and removed from a flight due to his size. Immediately after he was removed from the flight, Mr. Smith began tweeting about his anger regarding the situation, warning the airline it had "f****d with the wrong sedentary processed-foods eater!" My initial reaction was anger. I'm not -- and never have been -- a thin person. I used to be self-conscious about it, but as an adult I've learned to be more concerned about being healthy and less concerned about my physical appearance. Still, though, I find air travel to be a little uncomfortable (especially if I'm stuck in the middle seat), so I felt empathy for Mr. Smith as I read his initial tweets. I know I would've been angry (not to mention embarrassed) had what happened to him happened to me. And I probably would've tweeted about it, too. But that's where my empathy ends. Have I recently been wronged by a front-line employee of an airline (not Southwest) and taken to Twitter to vent about it? Yes. Did the airline respond to me? Yes. Did I respond favorably to the airline's efforts to make it right? Yes. That's what reasonable people do. But, unfortunately, that isn't what's happening in this case. Despite several reach-outs from Southwest -- both via Twitter and via a telephone call (for which Mr. Smith says he never received the voicemail) -- he just keeps spewing angry words via Twitter, ignoring and/or mocking every effort that the airline is making to reach out to him. Now, if Jane Citizen like me was doing this, it probably wouldn't be so bad for the airline. It wouldn't be great, since I do have 2,200+ Twitter followers ... but that's nowhere near Mr. Smith's level. The man has 1.6 million followers on Twitter -- surely all fans of his work, and surely many of them who take his advice to heart. What I think Mr. Smith fails to realize is that the people who are reaching out to him now are not the ones who wronged him. Instead, their job is a challenging and unfortunate one that is common among professional communicators at large organizations that serve the public: Cleaning up the very public messes created by others in the company. Do I think Mr. Smith has a right to be angry? Of course I do. Do I think his removal from the plane might've been unjustified and/or handled poorly? Yes. Might the airline's urgency and persistence in trying to remedy the situation be tied to the fact that Mr. Smith has a public platform and plenty of devotees at his disposal? Certainly ... but that doesn't make it "disingenuous as f***" as Mr. Smith suggests, particularly if Southwest typically is diligent about responding to customer complaints and concerns that arise on Twitter, which it seems to be. So, Mr. Smith, I hope you'll take a deep breath and think about this. Did the airline screw up? It would seem so. But there are several people -- none of whom have probably even met the people who wronged you -- trying to make this right, and you're only making their lives harder ... and potentially harming a business. You don't have to fly Southwest ever again. You don't even have to accept the airline's apologies. But, on behalf of everyone who's ever worked in corporate communications and/or customer service, I beg you to at least be respectful of the people who are trying to be respectful of you, even if it feels like too little, too late to you. Wow, very well said. Thanks so much for taking the time to write this and for sharing your thoughts. Hopefully we'll be able to resolve and address the issue both internally and externally. Situations like this are ever-increasing and I'm coming to the conclusion that folks are abusing social media as a platform to be whiny little brats. I agree with you 100%, sure, he was probably wronged, etc. but duuuude ... STFU about it already! I fear that because of situations like this and the "United Breaks Guitars" guy (and others), people will continue to b**ch & moan online every time something doesn't go their way, thus decreasing the "power" of social media because companies will turn a blind eye and a deaf ear to the very channel that they've done so well in embracing to increase customer service. Very well said. I am regularly set aback by folks that somehow think that electronic media allows you to abuse, berate, slander, and to spew rudeness with any repercussions or indentity for that matter. Folks need to be continually conscious that this broadening communication horizon needs to be treated just as if you were chatting via phone or in person. New technologies DO NOT and SHOULD NOT ever preclude basic human decency and personal respect. Thanks for writing this. What Mr. Smith is engaging in at this point seems to me to be social media bullying. Studies on this are happening; it's that "mob mentality" that can take over. You nailed it, Lindsey. They are trying to make it right and deserve respect for the effort. D) Something REAL, that hurts to do, in an effort to make things up to this upset passenger who apparently is a long-time customer!!! Because of all the reasons above, Kevin is doing a podcast and sharing the experience from his vantage point at http://www.smodcast.com and his opinion about this debacle matters to me too - not just the vantage point of the airline. I hope more than ONE person at Southwest Air listen to it and get what they really did here. I have to disagree with you for the most part. The posted "apology" doesn't actually apologize and pushes the blame on Kevin and the policy. It doesn't address why the policy isn't enforced consistently, and doesn't address the fact that Kevin said he could sit comfortably with both arms down which is the definition for SWA's fatass policy. Is he overreacting? Maybe, but I also haven't been impressed with SWA's response. They seem to tossing more fuel on an already out of control fire. Other than promising a phone which he says he didn't receive what have they done? I also don't feel too much sympathy for those that choose to work in customer service. Most corporations view customer service as an annoyance to their bottomline. That combined with the fact that most people are whiny and have so many options to spread the whining I can't imagine why someone would choose to get involved with that. All the airlines have a policy concerning passenger weight, not just Southwest. Some call this policy "Customers of Size," while others refer to it as a policy for those requiring an additional seat. The genesis of this policy is to ensure ALL passenger safety - meaning, airlines have had this policy for several decades. To illustrate, certain individuals cannot be seated in rows with emergency window exits, for example, if these individuals cannot physically assist in opening the exits. As far as the headline Southwest chose to make their apologetic response, their culture is friendly and fun. To me, that headline mimics their culture and seems like a way of reaching out to Mr. Smith. Mr. Smith has a forum, and I don't see that he's accepted Southwest's apologies, or, more importantly, engaged with Southwest to correct the situation so that it does not happen to someone else. Seems to me that he is in the perfect position to do something positive about it instead of continuing a rant. Let's see if he's only interested in the blame game. People seem to be losing the ability to use common sense and show some decency in these situations due to their new soapboxes. It's particularly disturbing to see those people see as role models abuse the privilege of holding that position in society. Hopefully things won't stay this way forever... hopefully. I think you wrote your article a little bit early. Kevin Smith specifically challenged SWA to come on the daily show and if he does not fit in the seat he will donate $10 000 to charity and if he does they owe him a public apology and to re-examine their policy. other than the minimum "i'm sorry but you're fat" letter, think they will have a genuine interest in resolving this misunderstanding and show up on the show? Doubt it. This whole thing is more than just this semi-famous person being thrown off an airplane for "size" - while it appears others who were larger were not - this type of thing happens quite frequently to John/Jane Q. Citizen who doesn't have the platform Kevin Smith does. Airline has been reduced to cattle cars, stuffing in passengers to smaller spaces, while oftentimes personnel seem to "delight" in being as rude, unhelpful, and discourteous as possible. Do some Googling. Dress thought too short? Off the plane. Breast-feeding your child. Off the plane. Talking child. Off the plane. This whole thing is a much larger - no pun intended - issue. He fit in the seat. Belt buckled, arm rests down. The people he was sitting between were fine with him. There was initial confusion over the fact he had bought an extra seat because they thought it was because he didn't fit into just one. He explained that this wasn't the case and that he bought the extra seat so he wasn't sitting next to someone on the flight(shy in person). The lady who pulled him from the plane was working the desk and wouldn't have had enough time to get to him to validate her excuse that it was the pilot's orders since he had just sat down. So this was decided ahead of time. He has maintained throughout that he has never been called by Southwest. He keeps tweeting because he wants to see policy change. That is the make-right he is after. As explained in his SModcast, his true motivation was the big girl from the return flight seated next to him that was pulled aside and told she would have to buy an extra seat, even though they had a seat between them. What is evident from this episode is that it's deemed perfectly acceptable to berate fat people because they're fat. So whatever comes their way is deserved, because if they only worked out more or ate less, this wouldn't be an issue. So he goes on Twitter to bring attention to the problem and try to get the policy changed and somehow he's in the wrong? Meanwhile, Southwest posted a blog which was intended to control the message and at least passively stay on the offensive. So you take their side over his? He's not in it for the apology or a $100 voucher, he wants to make sure that people aren't treated that way by Southwest again. Not sure I agree. I don't think he's a social media bully. It could have just as easily been me, you or anyone else. It only takes one journalist on a slow news week for this type of story to explode (thank you Google!) That's what happened with the Motrin moms...I seriously doubt people would call them all SM bullies (although I didn’t agree with them and was annoyed, as a marketer, that Motrin didn’t stand behind their research and marketing decision). I love Southwest and I don't think their brand will be tarnished by this. One reason is because they have strong brand equity and two, let's face it...it's a tough economy and their flights are cheap. No matter how annoyed people might be now, their wallets will speak in the future. My issue with this situation is the inconsistency of their 'profiling.' There was a gentleman three rows behind Kevin Smith that was much more a 'person of size' and yet SWA didn't ask him to leave. That is wrong. If I were Kevin I would have said "I am not leaving until all the 'people of size' on this flight join me." Heck, if it were me I'd do it because I have had people take my space that I paid for and I was the one leaning into the aisle or scrunching myself up in order to get some personal space. Fair is fair. The other thing I think we need to look at now is how “social companies” need to absolutely make sure ALL of their employees are trained on social media and understand how their offline actions may incite a social media firestorm. The conversation now needs to focus around lessons learned and next steps versus “He Said, They Said.” What’s done is done...how can we all learn and move forward?